The actor Curd Jürgens belonged to the most popular German movie stars of the post-war cinema and got the nickname "Der normannische Schrank". But few are familiar with the fact that Curd Jürgens already appeared in movies from 1935. He learnt his acting abilities by the actor Walter Janssen and made his stage debut at the Metropoltheater in Dresden in 1935 with the play "Ball der Nationen". He also made his film debut in the same with a small role in "Königswalzer" (35). For the present the theater became his main activity but till the end of war he also appeared in other movies like "Die Unbekannte" (36), "Zu neuen Ufern" (27), "Tango Notturno" (37), "Salonwagen E 417" (39), "Operette" (40), "Wen die Götter lieben" (42), "Frauen sind keine Engel" (43) and "Eine kleine Sommermelodie" (44). 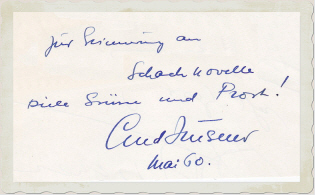 Curd Jürgens was called up in the last days of the war for tangling with the brother of Gestapohead Kaltenbrunner. The great breakthrough for Curd Jürgens came after the war. He conquered the audience with countless movies and especially the female fans were so-called enslaved to him. To Curd Jürgens most popular movies of the late 40's and 50's belong "The Mozart Story" (48), "Der Engel mit der Posaune" (48), "Wiener Mädeln" (49), "Der schweigende Mund" (51), "Meines Vaters Pferde" (53), "Orient-Express" (54), "Des Teufels General" (55) - one of his most famous roles, "Die Ratten" (55), "Michel Strogoff" (56), "...und immer lockt das Weib" (56) with Brigitte Bardot, "Les espions" (57), "Me and the Colonel" (58) with Danny Kaye, "The Inn of the Sixth Happiness" (58) with Ingrid Bergmann, "Der Schinderhannes" (58) and "Ferry to Hong Kong" (59) with Orson Welles. Curd Jürgens extended his film career to the international field from the middle of the 50's and belonged to a very busy actor till his death. In the 60's he took part in well-known productions like "Gustav Adolfs Page" (60), "Schachnovelle" (60), "The Longest Day" (62), "Lord Jim" (65), the serial "Babeck" (68) and "Battle of Britain" (69). To Curd Jürgens last movies belong "Ohrfeigen" (70), "Nicholas and Alexandra" (71), "Galileo" (74), "Folies bourgeoises" (76), the James Bond filming "The Spy Who Loved Me" (77) as antagonist of Bond, "Steiner - Das eiserne Kreuz, 2. Teil" (79), "Schöner Gigolo, armer Gigolo" (79) and the serial "Smiley's People" (82) as "General" at Alec Guiness's side - his last role. Curd Jürgens was married five times, among others with the actresses Judith Holzmeister and Eva Bartok.